All she wants for Christmas is her Master’s Degree. All he wants is a one-way plane ticket back to Los Angeles. Tiffany Zelling’s mission is to become a crisis therapy counselor using specially trained animals as comfort tools. She's focused on reaching the end of her school career, and nothing will stand in her way—not even a fantasy-world attraction to colleague Mitch Alexander. After a year as interim Director of East Coast Operations Mitch's tenure has been a resounding success. Now, he’s set to return to California and lay claim to a well-deserved promotion. He can’t wait to leave behind the cold and snowy darkness of Manhattan, but when corporate bullying and a massive snowfall throws him together with Tiffany Zelling, Mitch wonders if heading west is his best future. As two hearts build a pathway to love, goals shift and evolve. But as Christmas joy and hope move through the streets of New York, critical decisions must be made. Can their lives truly meld? 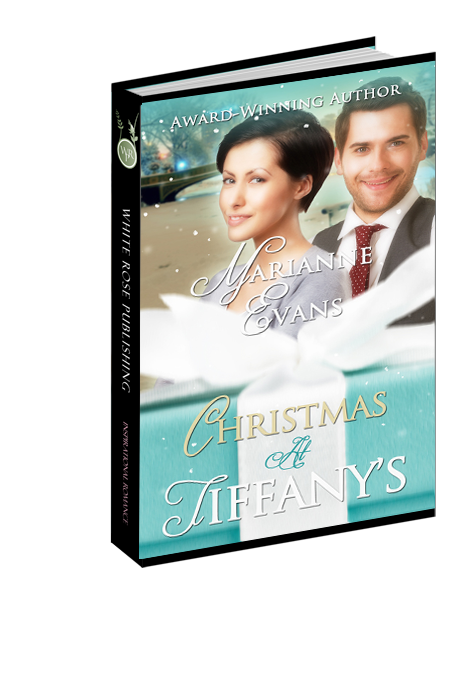 Can Christmas at Tiffany’s be God’s answer…for them both? As far as Tiffany Zelling was concerned, today amounted to nothing more than a complete waste of perfume. She squiggled backward in her office chair—just far enough to maneuver her feet out of high heels and jam them into a pair of walking shoes tucked beneath her desk. Seething, but hiding that fact behind a professional veneer, she got up and nabbed her coat and smart phone on the way out. Striding toward the reception area, and ready to breathe fire, she offered tight smiles to the colleagues she passed in the IT department of InfoTraxion, a multi-national tech firm housed on the thirty-eighth floor of a skyscraper at the heart of Midtown Manhattan. Maybe she’d even linger a bit over the freshly unveiled Christmas displays adding light, color and festive life to the store windows along Fifth Avenue. The arrival bell chimed and the tension creeping along Tiffany’s shoulders immediately eased. She stepped inside the elevator, leaned against the rear wall and closed her eyes, soothing herself further with a bit of in-and-out deep breathing that helped restore her more typical sense of calm and quiet. She tried hard to live up to the Christian ideal of love-thy-enemies, but her boss, Eric Parker, stretched that belief to maximum. He was insufferable. Striding through the marble lobby, dodging bodies with long-honed practice and skill, she moved through the badge-accessed entry point and pulled on a pair of gloves. Hunching her shoulders, she absorbed a blast of air that struck her body the instant she stepped outside. But the wind came and went, sometimes gusty and strong, sometimes retreating against a stillness that carried with it a snow-globe style shower of flakes. Tiffany soaked in the atmosphere, watching the graceful fall of fat, air-crowding crystals of white. The first stop she made was for the sweet treat she craved. Thankfully, the line at Magnolia moved fast, championed by a clerk who recognized Tiffany as a regular and didn’t even need to ask for a preference. Handing a white wax sack over the counter, delivering a wink and a smile, the clerk made change for a five and Tiffany was on her way with a handful of red velvet cupcake topped by swirls of white cream cheese. Perfection, she thought. See also: restorative bliss. Pausing beneath the Atlas clock stationed atop the front entrance of Tiffany and Company, Tiffany smiled and gave a thoroughly relaxed and delighted sigh, lifting her face to the sky. Snowflakes kissed her lashes, her cheeks and lips with an appealing chill. Continuing to enjoy her cupcake, she paused before the iconic store’s glass window and surrendered another quiet, pleasured sigh. Tucked upon a plush white bed of faux snow drifts were dozens of artistically stacked aqua blue boxes—some secured by red satin ribbon, some secured by white. The entire back wall of the display was crafted to resemble a miniature version of New York City at Christmastime, complete with gift-laden sleds, yellow cabs with massive back fins and lights clicked on within the depths of cheery-looking apartment building windows. If only life were that simple—that perfect. Tiffany tossed the thought aside as an Atlantic-born current swept by. She focused instead on designs created to dazzle the eye. Strategically draped diamond necklaces were snuggled next to chunky engagement rings and eternity bands. Bracelets of gold, sapphire, ruby and emerald formed a sparkling pattern at the front of the display. Then there were the pearls. Tiffany nibbled on her cupcake, swallowed and swooned, captivated by an enticing fantasy world. Yards of perfectly matched orbs—white and black—had been twined together and strewn against the snowy floor, giving a lustrous shimmer to the entire visual. Lost in the beauty of precious stones and radiant light, she polished off the last of her treat. After dabbing crumbs from her lips with a paper napkin, she moved closer still, resting her fingertips against the glass. She needed to get back to work. Dedication to performance and a solid work ethic that had haunted her since birth were the blessing—and curse—that prompted her to move away from simulated perfection and return to the lion’s den. Be that as it may, she was in no hurry. Fifteen-minute afternoon breaks were expected and encouraged, and she needed every last second of this one. Meandering toward the intersection that would lead back to InfoTraxion, Tiffany pulled her phone from her coat pocket and speed-dialed her sister, Melody. “Hey, Tif!” Melody was the only person on earth allowed to refer to Tiffany as Tif. A beat of silence passed. “That Parker guy? Eric, isn’t it? Melody was her big sister. She understood the fact that late afternoon exits from the office, which included decadent cupcakes and window drooling—er, shopping—most likely spelled trouble on the job front. Therefore, Eric Parker could take a lengthy hike into the oncoming arctic blast for all she cared. Melody teased about ‘vacating’ her family, but she and her husband Jack had an awesome marriage—the kind of marriage that gave Tiffany just enough hope to believe in happy endings. “You could always bring the boys. I’ll bet they’d love seeing the city at Christmas.” Tiffany loved doting on her nephews. Her sister signed off just as a sustained blast of moist, icy air curved around towering skyscrapers. Folks jostled past, propelled along the sidewalks by the rapidly deteriorating weather. In passing, Tiffany glanced at the Atlas clock. It was just after two PM. Three more hours at the office and she’d be home free, no matter what kind of antics Eric-the-jerk-Parker had executed while she was gone. Mitch Alexander braced for trouble the instant Eric Parker stormed across the threshold of his office and performed a none-too-discreet close of the door. That much was obvious. Mitch angled his chair away from the dual monitors that rested on his desk and focused on the team leader of his information technology department. Presently this IT wunderkind, whom InfoTraxion had nabbed from its closest competitor a half-year ago, was ruddy cheeked and his eyes sparked hot. The flat-out rebuke, full of corporate-speak rather than solid evidence, left Mitch relying on an acquired ability to keep cool under pressure. Mitch had been transferred to New York from Los Angeles HQ over ten long months ago, asked by the owner of the company to take the helm of east coast operations. At the time, he had been told the position was temporary. They needed a regional director who not only understood systems management, but also understood business operations—someone who could keep production levels and employee morale at suitable levels until such time as a replacement could be found. The fact that business had doubled during Mitch’s brief tenure left the leadership squad in Los Angeles content and in no great rush to find another candidate. Increasingly eager to return to the west coast, Mitch faced this episode head on, ready to add it to his repertoire of the ways in which his time in New York City had benefited the company. The comment reeked of false sincerity, but Mitch chose to let it pass. Why exasperate the issue? Mitch seethed within an onslaught of heat. “Eric, I can easily explain what happened. She wasn’t on the rescue site for personal reasons. At my request, she was researching the methods by which InfoTraxion might support the shelter where she volunteers. In honor of Christmas, I intend to seek corporate approval for a charitable contribution to the organization.” That piece of news didn’t stem the fire in Eric’s eyes, not that Mitch expected it to. The meeting ended but Mitch knew Eric was far from satisfied. Too bad. Mitch knew Tiffany’s history with the company. She had been part of the systems development team for almost three years, proving herself as pro at follow through and an exceptional end product. He had tamped Eric’s fiery crusade for the time being, but sensed the deeper reach of the man’s personal tensions toward Tiffany. Mitch wouldn’t tolerate them for long. Tiffany was quiet to the point of studious—introverted and pleasingly shy. He severely doubted she had earned the show of hostility based on professional capabilities. His mind’s-eye drew the portrait of a woman with large, dark eyes and a short, straight cap of black hair worn in those soft, tempting type of layers that caught the air when she moved, dancing and shifting like ripples around a fair, heart-shaped face. Pursing his lips, tilting his chair backward so he could look outside, he contemplated the view of a winter storm on the brew. He ignored the onslaught in favor of his own personal countdown. In one short month—January 1st to be precise—he’d be back in Los Angeles, and he could leave the snow-cast gloom of the east coast behind in favor of sun, warmth, beaches and incomparable mountain vistas. He had done his time and earned his spurs on behalf of InfoTraxion. With all due respect to NYC, he couldn’t wait to get back home to California. Meanwhile, the Christmas season was kicking into full swing, and he wanted to encourage philanthropy. Business focused and intent, Mitch returned to his computer and crafted a meeting invite to Tiffany’s e-mail address and clicked send.